OmniFocus is the 800lbs gorilla of task management when it comes to OS X. They have companion iPad and iPhone applications, free built-in sync, and a healthy respect for a GTD-style system. To top it off, OmniFocus 2 a refreshed and pleasant user interface that compares well to their iPhone and (to be released) iPad application designs. The sync is what gets me coming back to OmniFocus. It doesn’t play nice with other systems, has no web-based UI, and it costs a lot in comparison to other task management systems designed for personal use like Trello or Clear. The main advantage it has is solid off-line syncing capabilities. Once my phone is up-to-date walking into the middle of a grocery store with zero cellular service becomes a less frightening affair. Because of the solid sync between all platforms OmniFocus is my go-to personal task management system. It’s not great at managing things like external clients or interfacing with other people, but just for me? Works well. 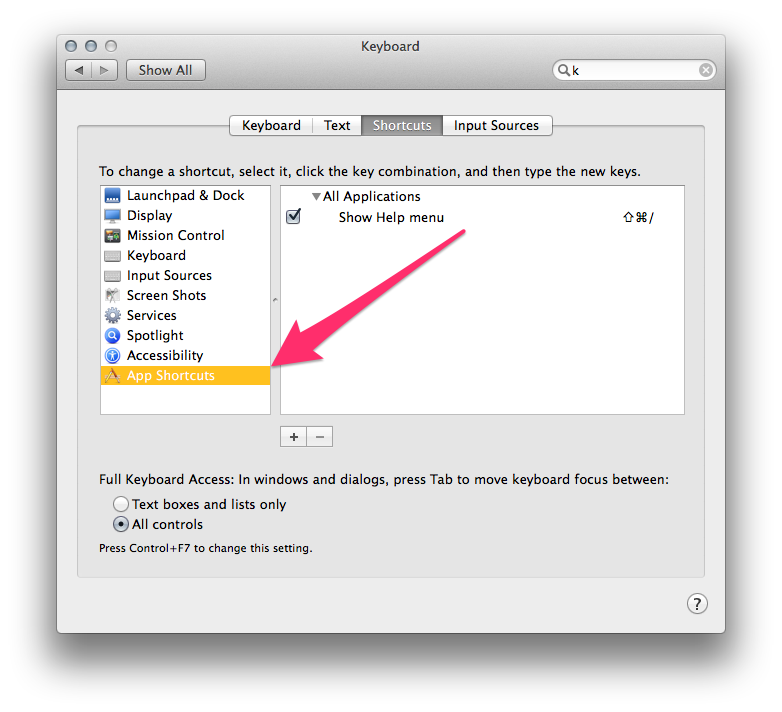 Since OmniFocus 2 came out one thing that has been nagging me is the CMD+O keyboard shortcut for launching the Quick Open Alfred-like functionality. Using Quick Open you can quickly jump into any project, context, or folder with just the keyboard. It’s a great feature and a welcome productivity boost for the power user. What’s the problem with CMD+O? Sounds pretty normal for lots of people, but as a developer a lot of tools that I use — Sublime, Slack, MailMate to list a few — use CMD+T to trigger that go-to-anything functionality. This comes down to personal preference and muscle memory. I’m used to using a different shortcut and having OmniFocus broke that flow. On top of it, as Ken kindly points out, the shortcut I like is often used to trigger the Font panel. Luckily there is a way to change that, using something I’ve honestly never heard of — and I’m suppose to be the smart guy with computers. 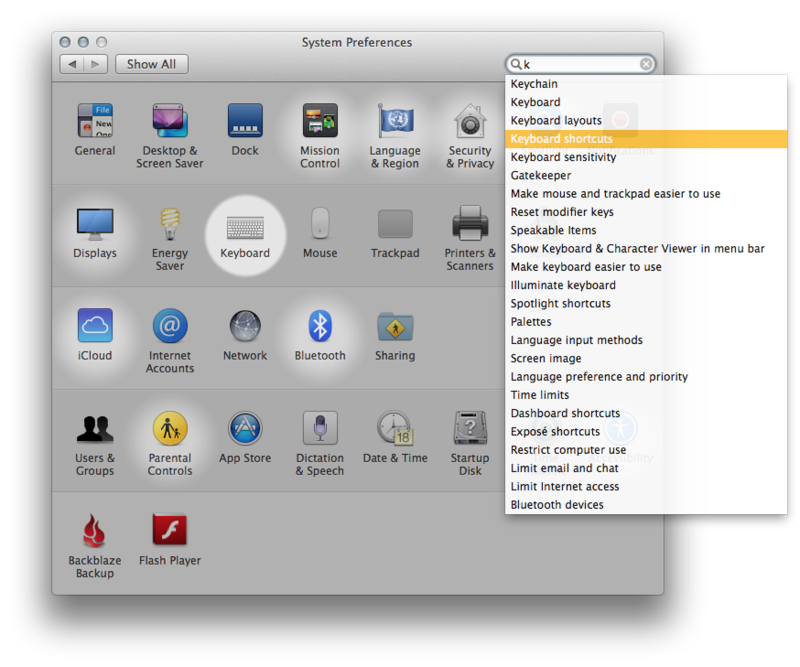 Open up Keyboard Shortcuts under Settings. 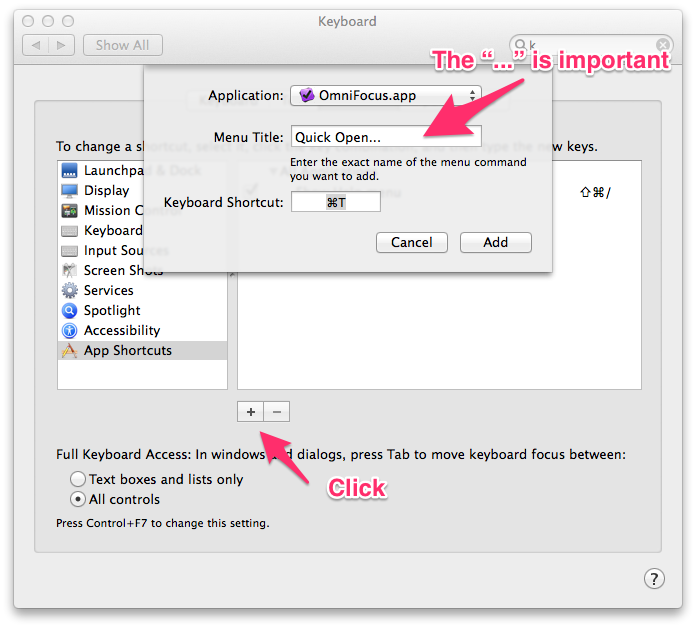 Add a menu item shortcut for OmniFocus. Voilà! 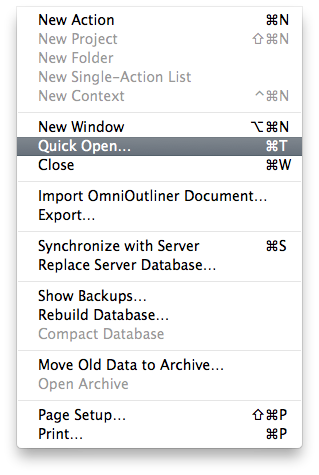 The menu item for “Quick Open” should now be changed in OmniFocus. You can verify by clicking on the “File” menu and seeing what shortcut key is selected. I want to thank Ken Case for pointing this out to me. I learned something new and increased my productivity in using OmniFocus.